Where are the tea pluckers, under their pointed hats? In eastern China, in Fujian or Zheijiang, for example, tea pluckers ware pointed bamboo hats to keep out of the rain and the sun. Here, I barely had the time to fix my depth of field that the tea pluckers disappeared to have lunch. They left there their nice hats. 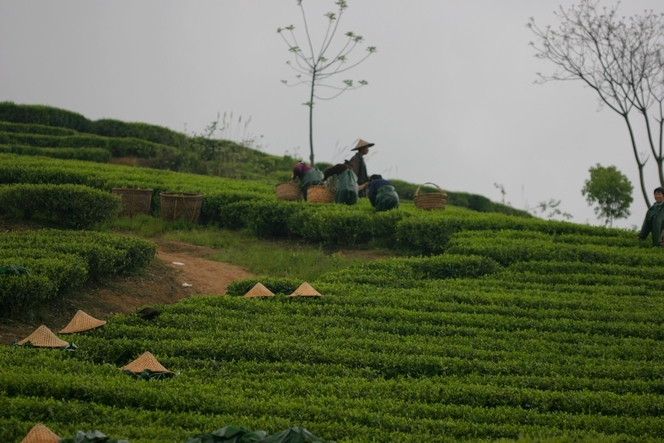 So in this tea field, it seems that goblins are playing hide and seek and that only their small hats are sticking out. I like this photo for this funny side. I imagine that the hats are going to raise up and that I’ll see grinning faces. The end-of-year festivities are often associated with the colours green and red. Green like the needles of the Christmas tree, red like Santa Claus; green and red like the leaves and berries of holly. So I looked through my photos to see what I had in these shades, to offer you a touch of seasonal cheer, but I found nothing. But then I realised that I give you green throughout the year, with the fields of tea, so I thought a bit of red would serve to illustrate the season. In a city like Kyoto, with more than a thousand temples, there is not one dedicated to tea. It is not very fitting for a country where so much of it is drunk. Last month, a little disappointed by this observation, I have to say, I decided to call on the Rice God instead, and set off to visit his temple. 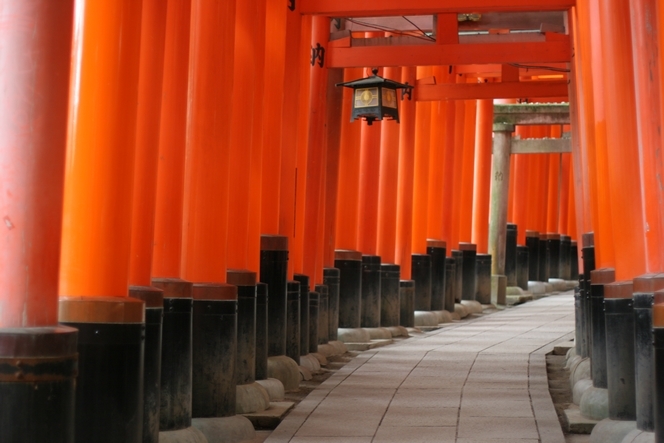 I am glad I did, because it means I can bring you an image of the wonderful red pillars of the Fushimi Inari-Taisha sanctuary. This Shinto temple has thousands of the beautiful “tori”. I hope you like this end-of-year celebration in red. Enjoy the festivities! As promised, here’s a picture of the team who accompanied me to Darjeeling last month. From left to right: Yann (Rue du Cherche-Midi store, Paris), Stéphanie (Grenoble store), myself, Virginie (Brussels store), Thomas (warehouse), Carine (Ecole du Thé), Maud (Rue Vieille-du-Temple store, Paris), Fabienne (Lille store) and Nathalie (human resources). We spent a week in Darjeeling, where this great team were able to discover the region I love, meet our suppliers, and put every question imaginable to the tea plantation managers. And meet the people who toil to produce such rare teas. We had some wonderful encounters, and the trip further deepened my understanding of this field, which I have always found so rewarding. Yunnan’s black teas are well known (Yunnan Tips, Yunnan d’Or, Grand Yunnan Imperial), as are its dark teas (Pu Er). But did you know that this Chinese province also produces green teas? They may not be as prestigious as the green teas from Anhui, Fujian, Zhejiang or Jiangsu, but they are honest, sometimes a little astringent. 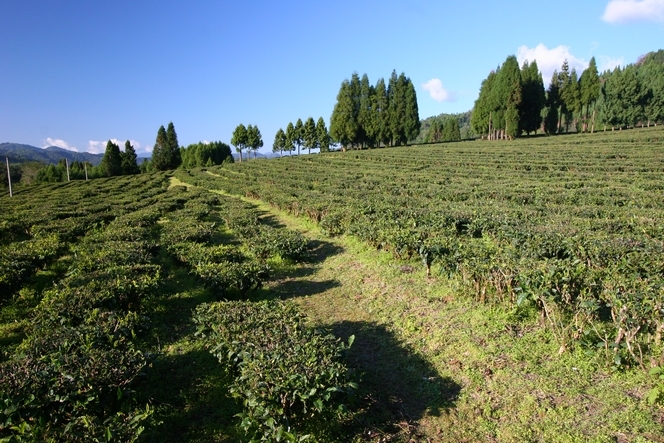 The tea plants you see here belong to the Meng Non Shan Tea Factory owned by Mr He Qi Chuan. This is a high-altitude plantation. One of the teas it produces is Jade Needles. I was curious to taste this tea, and did so in the company of the owner, who was very hospitable. I didn’t buy anything but it was a pleasure to spend time with him and see his beautiful fields of tea. 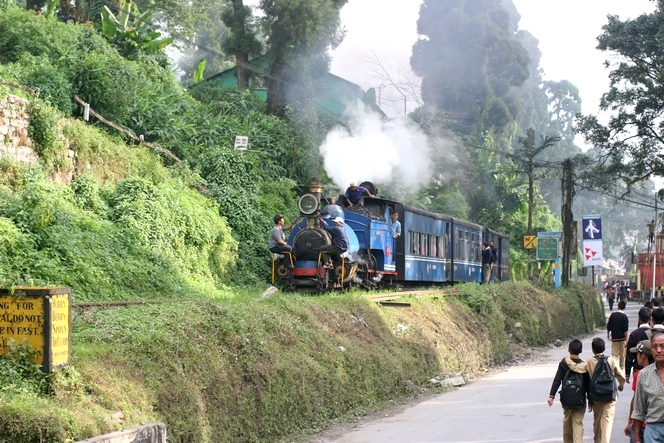 I warned you: the little Darjeeling train steams into my blog whenever it feels like it. Here it is at home. You will see that no fewer than four people seem to be required to run it today, and I wonder if there might be a fifth in the cab. Actually I can never be sure how large the crew is, because each time I see it, the number of people working around the locomotive varies. 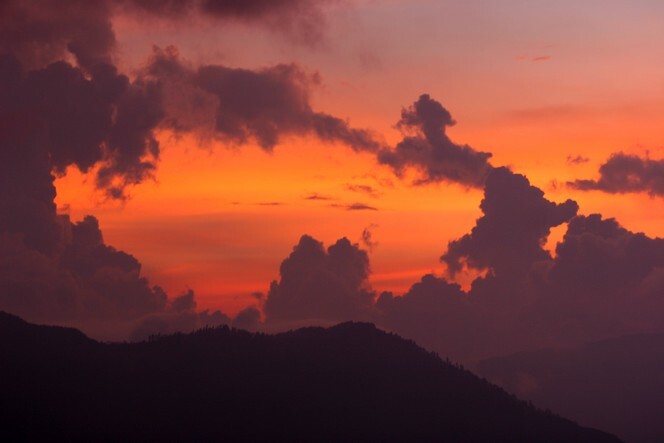 One thing I am certain of, however, is where I took this photo: in Kurseong, just after coming out of the “Kurseong Tourist Lodge” where I always stop to eat a plate or two of momos before continuing on my way to Darjeeling. There were many tea houses in China until Mao shut them down. No dens of vice, they represented entertainment and debate. 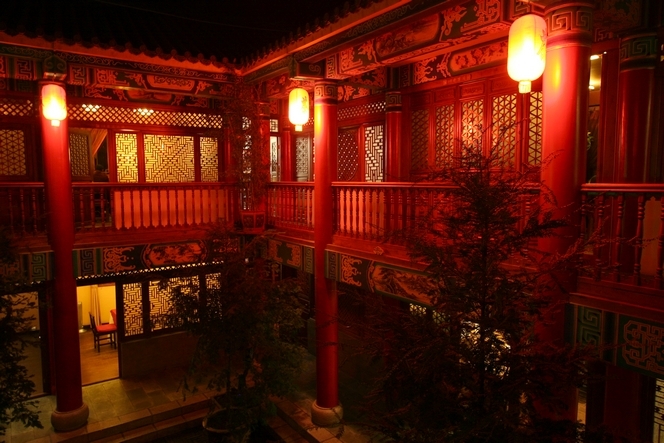 People went to tea houses to enjoy a cup of tea and join in a discussion, or for a poetry reading, or simply to sit and listen to the chirping of the caged crickets. Today, tea houses are back in fashion. They are flourishing all over China, and it is interesting to see the very young clientele that regularly frequents them. These customers clearly enjoy a certain standard of living, because tea is not always cheap in the tea houses, especially those located in areas popular with tourists, like this one in the centre of Kunming, by the delightful Green Lake. 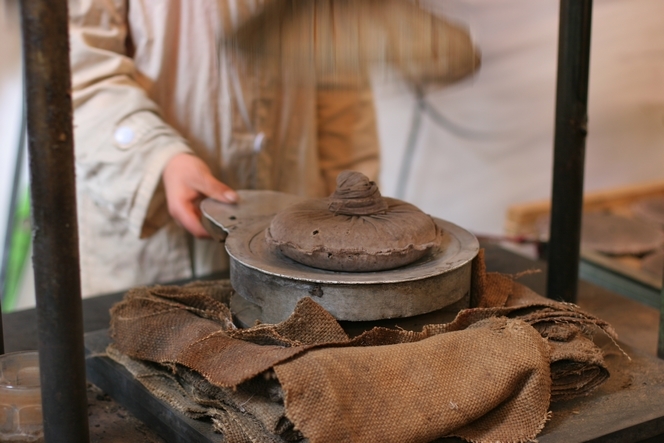 In the past, Pu Er cakes were compressed by hand using a large stone with a handle and convex underside to weigh down the leaves. Today, it is carried out in a similar manner. 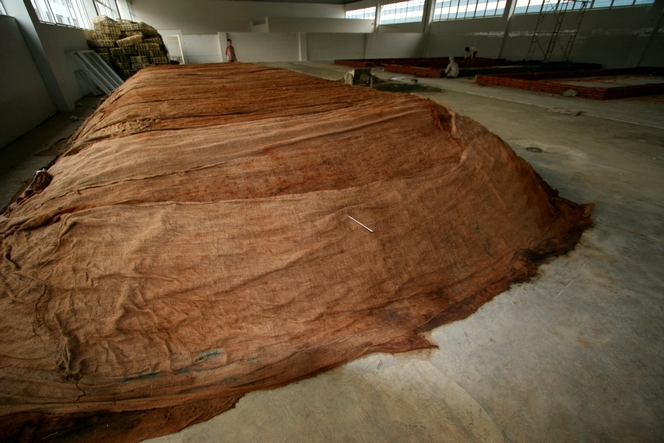 Once the tea leaves have steamed, they are wrapped tightly in a cloth. They are then compressed mechanically, as you can see in this photo taken in a suburb of Kunming, at the Gu Dao Yuan Tea Factory. Traditionally, Pu Er tea is sold in “cake” form that weighs 357 grams. 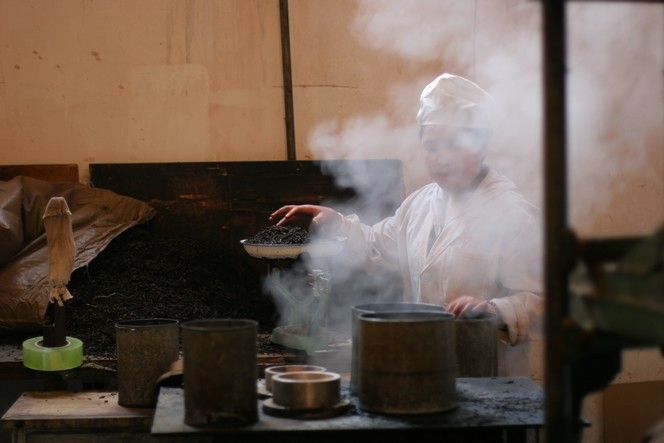 Here, you can see the first stage in the manufacturing process: the woman weighs the tea to the nearest gram, then tips the exact quantity into a metal cylinder with a perforated base, which she places above a source of steam. On contact with the steam, the tea leaves soften and are then are ready to be compressed.